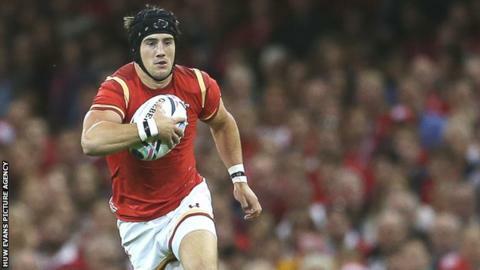 Wales full-back Matthew Morgan could bring a "bit of magic" to the team like legendary former wing Shane Williams, says forwards coach Robin McBryde. Morgan, 23, will make his first international start when Wales face Fiji in the World Cup on Thursday. McBryde believes Bristol's 5ft 7in utility back can dazzle like Wales' record try-scorer Williams. "He's quite a slippery character. I wouldn't like to try and stop him in a five-metre channel," said McBryde. "One of the best things with Matthew's selection is the fact the whole of Wales can see the strengths he's got and can identify with him as a Wales player of old with that swing of the hips, that extra bit of magic, something different. "He's akin to Shane Williams with regards to the threats he possesses." Morgan is one of three changes from the Wales team that beat England 28-25, replacing the concussed Liam Williams. The former Osprey has won four caps for Wales, all of them as a substitute and the latest coming in Wales' 54-9 drubbing of Uruguay in their opening World Cup match. Morgan will be the smallest player on the field when Wales face Fiji, but McBryde is confident his skill will compensate for his size. "Matthew's strengths are evident for all to see," he said. "Because the supporters will be able to identify with that, they'll get behind him and, I dare say, every time he gets the ball in his hand, the roar will go up and the anticipation will grow. "Hopefully the Fiji front five will start panicking a bit when they see him opposite them." "It was good for the boys to talk to Joe," McBryde said. Joe Calzaghe (right) ended his professional boxing career unbeaten. "He has stayed loyal to his roots. He thrived on being the underdog. "It was great to have a bit of respite from rugby and talk to one of the greatest boxers in the world." Fiji beat Wales at the 2007 World Cup, their only win over the Welsh in 10 meetings, but McBryde believes the mentality in the current side is different. "It is the resolve we have, the consistency in the squad and the resilience that is in the team," he said. "The players have been there before." Matthew Morgan (Bristol Rugby), Alex Cuthbert (Cardiff Blues), Tyler Morgan (Newport Gwent Dragons), Jamie Roberts (Harlequins), George North (Northampton Saints), Dan Biggar (Ospreys), Gareth Davies (Scarlets); Gethin Jenkins (Cardiff Blues), Scott Baldwin (Ospreys), Tomas Francis (Exeter Chiefs), Bradley Davies (Wasps), Alun Wyn Jones (Ospreys), Dan Lydiate (Ospreys), Sam Warburton (Capt - Cardiff Blues), Taulupe Faletau (Newport Gwent Dragons). Replacements: Ken Owens (Scarlets), Aaron Jarvis (Ospreys), Samson Lee (Scarlets), Luke Charteris (Racing 92), Justin Tipuric (Ospreys), Lloyd Williams (Cardiff Blues), Rhys Priestland (Bath Rugby), James Hook (Gloucester Rugby).